The beginnings of the electric guitar blues solo. And how two talented guitarists crossed the race divide and laid the foundation for later blues guitar virtuosity. 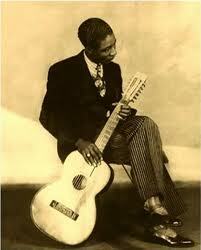 Lonnie Johnson was born in New Orleans, Louisiana and raised in a family of musicians. He was a talented multi-instrumentalist, but excelled at the guitar. By the 1920s, his musical career was flourishing and in 1925, he won a blues contest in St. Louis, which set him up with a recording contract with Okeh Records, making around 130 recordings over the next 7 years, and playing with the leading blues singers of the day such as Victoria Spivey and Bessie Smith. Johnson was an exceptionally talented musician and his “To Do This You Gotta Know How”, recorded in 1926, was ground-breaking and remains an exceptional piece of blues-jazz guitar wizardry. He introduced an entirely new style of guitar playing and was “undeniably the creator of the guitar solo played note by note with a pick, which has become the standard in jazz, blues, country, and rock”, according to blues historian Gérard Herzhaft. Johnson’s style underpins what we know as modern electric blues guitar playing. On 17 November 1928, Johnson went into a recording studio in New York to record some instrumental blues guitar tracks with another, exceptional, young guitar-talent, Eddie Lang. At this stage Lang was the most in-demand session player in New York and a regular on radio shows, theatres and concert halls. 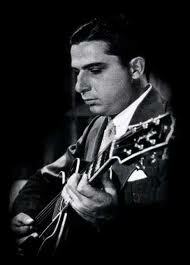 Lang is regarded as the father of jazz guitar and played guitar on the original recording of the jazz and pop standard “Georgia On My Mind“, recorded with Hoagy Carmichael and His Orchestra in 1930. In 1924 he had recorded what for many years was believed to be the very first single-string guitar solo “Deep Second Street Blues”. What wouldn’t you give to have watched these two exceptional guitarists trade licks and riffs on Two Tone Stomp and How to Change Keys to Play These Blues? As Denny Illet has recently noted, “the course the guitar took from that point on is largely due to what Johnson and Lang played that day and over the course of the next year or so”. The fact of Lonnie Johnson and Eddie Lang recording together at all is a matter of some significance. Black and white just didn’t mix like this. In the 1920s, we’re still in the thick of the worst of segregation, racism and discrimination against African Americans. When the records were released, aimed at the black-oriented market, Lang was billed as Blind Willie Dunn, suggesting that he was black. The two men, however, seemed to have ignored the social mores of the day and collaborated a number of times over the next couple of years, until Lang became the main accompaniest for Bing Cosby. Discrimination and oppression on the basis of race or ethnicity is, sadly, as old as the history of humankind. Which makes what the apostle Paul has to say in his letters to the first Christian communities so important. These communities typically comprised both Jews and Gentiles and there were often tensions between the two groups. When he wrote his letter to the Galatians, Paul was furious that some from a Jewish background were trying to force Gentile believers to have to observe Jewish laws, like circumcision. When he wrote to the Romans, he was trying to discourage Gentile believers from a superior attitude to their Jewish sisters and brothers. For Paul, the Messiah, Jesus, “has made us both one and has broken down in his flesh the dividing wall of hostility…to create in himself one new person in place of the two, so making peace.” Because of what God has done in Christ, there is a “new creation” – there is a new humanity for Jesus-followers, which takes no notice of cultural, ethnic or racial divisions. A united, harmonious, peaceful, new humanity is a crucial element of the new, just world that God has called us to. So Jesus-followers are not to tolerate unjust discrimination either in our own communities or in the wider world. Rather, we’re to demonstrate the way things should be in God’s new order and to protest and seek justice where we see injustice perpetrated against others. Lonnie Johnson and Eddie Lang showed the wonderful creative possibilities when courageous people are prepared to swim against the tide, and act in accordance with ideals of justice and our common humanity. They acted in a way that anticipated a future day when white and black could work together without one exploiting the other. In a similar way, Jesus-followers need to anticipate God’s just future in the way that we live now, no matter what the cost. The possibilities resulting from that are world-changing.